Size Select a Size 2 oz. 4 oz. 8 oz. 16 oz. EXTREME WEATHER WARNING: These are Live Nitrifying Bacteria, therefore, we do not recommend ordering if your weather currently exceeds 105F or drops below freezing in your area. Thank you for understanding. 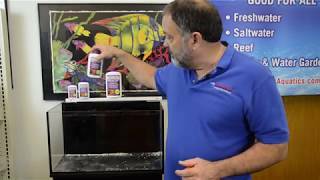 Treat aquarium nitrite and ammonia levels, instantly! Use One & Only when setting up a new tank, after a water change, cleaning your filter, when adding new fish and after a disease treatment to control ammonia and nitrite. The key to setting up a successful aquarium is to quickly convert the fish waste to a non-toxic form. This is done by nitrifying bacteria. Under normal conditions it can take 30 to 45 days for these bacteria to become naturally established in a newly set-up aquarium. Unfortunately, during this time period, ammonia and nitrite can increase to levels toxic to fish – a process called New Tank Syndrome. For years, it was assumed that two particular species of nitrifying bacteria were responsible for this process but original scientific research by Dr. Timothy Hovanec showed this not to be the case. This is one reason why nitrification products have failed to work in the past. One & Only Live Nitrifying Bacteria are the result of the latest scientific research and are used by public aquariums and professionals around the world. Best to keep refrigerated for longest shelf life. Dr. Tim`s Aquatics is the merging of the twin passions of the founder: fishkeeping and science. They make setting up and maintaining an aquarium easy by sharing practical advice and proven products developed through years of experience and their own real science. Their products are developed with a simple goal – to make fishkeeping easy. You don`t need to be a biologist or chemist - they`ve got that covered! You don`t have to make mistakes – they`ve made hundreds so you can learn from them. Just have a little patience. There`s no magic or secrets – they`ve done the research and produced the products. Dr. Tim has published numerous peer-reviewed scientific papers on nitrifying bacteria and filtration for aquariums and aquatic life-support systems. He also has written dozens of articles and columns for aquarium trade and hobby magazines. He has been an invited speaker to many national and international conferences and regularly speaks to aquarium societies. Dr. Tim hold numerous patents for nitrifying bacteria, their use to accelerate nitrification in aquatic systems and their detection using molecular methods. I used this to cycle a tank. Seemed to handle Nitrite better than the first bacteria I used.